Salomon and Bizuayehu win Maraton de Sevilla in 2h10:14 and 2h29:52, respectively The 29th edition of the Maraton de Sevilla has been one of the fastest races of this season in Europe. Kenyan Salomon Busiendich in 2h10:14 and Ethiopian Ehite Bizuayehu in 2h29:52 take the victory in a great and sunny race day for 7,150 registered athletes. 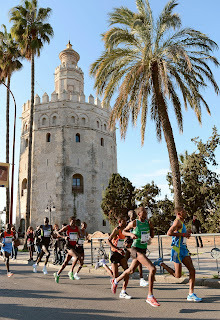 European marathon focus was today in Sevilla, and the race was simply perfect. The XXIX edition of the Maraton de Sevilla took place in the city centre of the city in a brand new totally flat race course. In the male category Kenyan Salomon Busiendich led the African pack of 10 top runners from the begining. After passing the 30km point, Salomon pulled away and got a ‘smooth’ victory with 2h10:14 at the Finish Line on the same track of the Olympic Stadium that hosted the Athletics World Championship in 1999. Salomon went into the 35km with too much of a lead for Eritrean Yared Dagnaw Sharew to make up, almost 2 minutes. Finally, Sharew finished second in 2h12:37, and Kenyan Emmanuel Samal completed the podium in 2h13:10. Spanish Javier Diaz Carretero, was 7th in 2h15:34. Salomon was running till km 40 sub 2h08, but he couldn’t keep the pace the last two kilometres. Ehite Bizuayehu (ETH) won the Maraton de Sevilla today in 2:29:52, her Personal Best and her first victory in a marathon race. She was the fastest women from the half marathon (1h14) and run alone the final kilometers. Two more Ethiopian athletes, Megersa Megertu Tafa and Wudnesh Nega, were second and third, respectively, two minutes gap. The first Spanish was Estela Navascues, 4th, in 2h37:14. 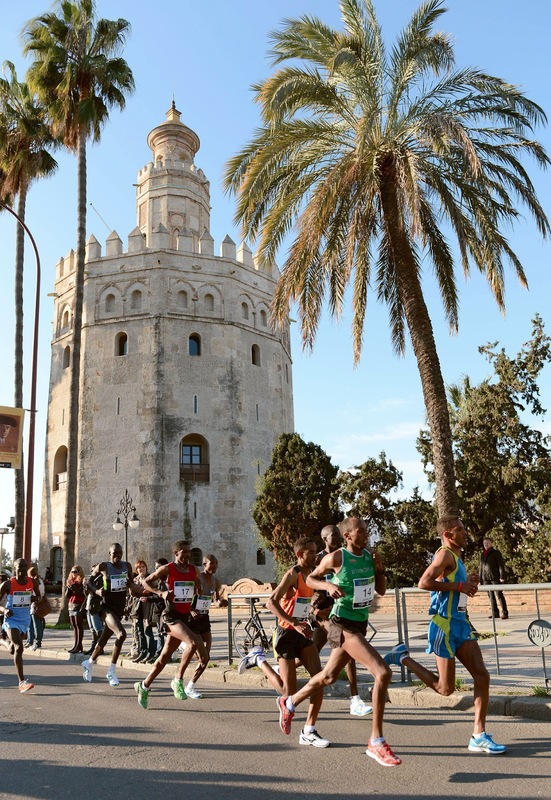 Maraton de Sevilla is opening its door to the international runners community and has unveiled a new and absolutely flat race course in one of the most scenic venue possible, in the city centre of Sevilla, crossing through all the main monuments and historical streets. One month ago was sold out, with more than 7,000 athletes registered. Javer Diaz Carretero (ESP, 7th, 2h15): “I tried to run faster as I did here a few years ago, but I’ve run alone most of the time. In this kind of races to be the first European at the Finish Line is almost a victory”.